Last night was the first I’ve been back to the village since money issues went down six weeks ago and I was asked to pay for Akanese’s school fees. 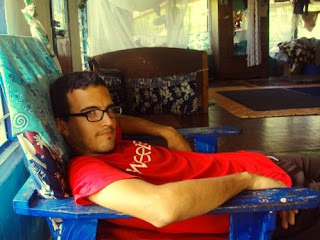 Those six weeks mark the longest I’ve gone in Samoa without visiting the training village, and I got the impression that my absence was felt, and it also seemed like they picked up on the fact that I was annoyed about the whole money issue. And while that made for a contentious homecoming, I still felt like I was welcomed with open arms. Since Paul and I waited for 2 hours for a bus last Friday, I waited until I boarded a bus before I called my host sister Asolima to tell her I was coming. The first thing she said was, “Long time no talk!” True that. I managed to make the second-to-last bus of the day, which is far better than catching the last. In addition to leaving later, the last bus tends to be the most crowded. Also it fills up with inebriated college students going home for the weekend, which makes for an unpleasant ride. Catching the second-to-last meant I got to sleep and read. Awesome. As it turned out, Asolima was gone for most of the time I was there. One of Oge’s family members (I think a cousin or a nephew) who lived in American Samoa died, and a bunch of family arrived last night for the burial. 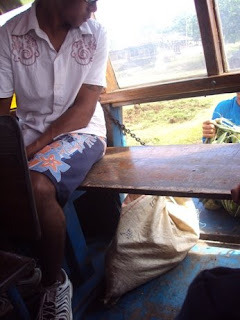 After dinner, Asolima set out with Keleme to pick up family from the wharf and take them to Apia. The rest of us headed to Bingo. I sat with Tafale during Bingo, which brought a different dynamic to the experience. Usually I sit with Asolima, who has great English and explains things thoroughly, but is quite unforgiving when I miss numbers that have been called. Tafale was much more gentle when I missed N34, but she was also a little more vague with explaining the object of the round (e.g. 2 lines and a 4-block, 3 small kites, blackout, picture frame, etc.). It was a more independent Bingo experience, I guess, which was cool. We ended the night by watching “Resident Evil: Nemesis,” which was playing on one of the local stations, and eating Top Ramen. It felt like college. When I woke up this morning, everybody else was asleep. I don’t think this has ever happened in the host village. So I went back to sleep. And when I woke up a second time, everyone was up and looking at me like I’m a lazy jerk for sleeping in until 8 a.m. on a Saturday. Now that’s more like it. I had barely woken up when Asolima came in and paid me back the $20 for Akanese’s school fees. I was blown away. I had never expected to see that money ever again, so this was very exciting. 10 minutes later over a breakfast of crackers and curry, Asolima explained that because of the death of Oge’s nephew, she needed to buy a case of tin fish to give to the family, and it would be great if she could have the $20 back. Easy come, easy go. Done and done. Mele left early to go into town and hawk Koko Samoa at the open market. I stayed home with Fipe, Akanese, and Asolima. We watched “Mamma Mia!”, which my parents brought during their visit. Then we all took naps. Fipe, Akanese, and I waited for the bus together. Fipe was impressed with my pen twirling. 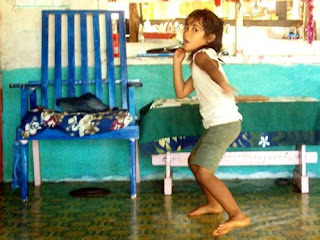 While she was practicing, a road crew came through to paint white lines down the center of the road. I made Fipe get closer to snap photos. And while she was doing that, my bus arrived. I sat down on the bus and heard a shriek from the back. I looked, and a man had loaded a pig in a burlap sack in the cargo area of the bus. The pig was not happy about this. Just another day in the nu’u. I hope you’re enjoying your Saturday. Pictures below. 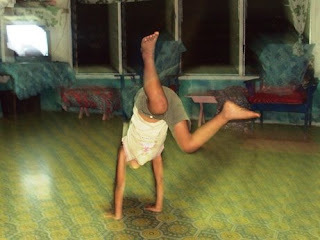 Cartwheels in the living room. I remember Marlis, Emily, Annie, and Tanya making chains like this. True, Akanese isn't actually doing Keleme's hair, but you can see it starting to evolve. Not sure what these are. They've been described to me as Samoan sunflower seeds. You pop them open with your teeth and spit out the rind. They're not nearly as easy to shuck as sunflower seeds. Throwing paper airplanes in the living room this morning. 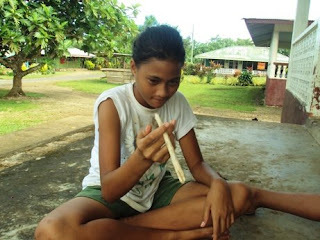 Fipe practicing pencil twirling with a stick. That sack has a live pig in it. 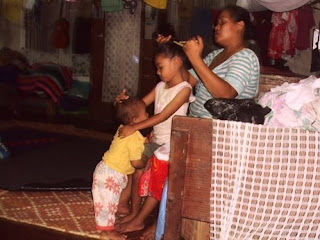 That was some authentic Samoan family weekend you had. Especially with the initial akward stuff..Ahh brilliant the easy come easy go of the $20 tala. That little exchange must be submitted to the Ferengi Rules of Acquisition council. 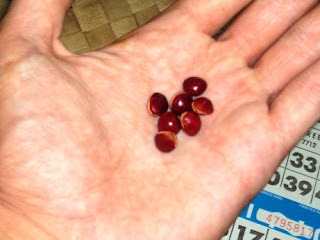 The little red nuts are called "lopa". The nuts are in a pod(like peas) about 6 inches long and found on a tree which looks like the leaves of a tamarin.